Washington, DC woman owned business offering high quality unique handmade products to include 100% all natural soy & coconut oil candles, body butters, soaps and dope tees! I'm extremely pleased with my candle. I've always dealt with anxiety. This candle has really helped me with my meditation sessions. It's amazing. I will tell everyone I know about Efua's Baby! Much Love! Nandi Tonge-Gabremedhin is an artist, creationist, and the owner of Efua's Baby. Nandi was raised in Teaneck, NJ and Harlem, NYC later moving to Washington DC to finish high school at Duke Ellington School of Performing Arts. Then attending Howard University to study Dance and Fashion Merchandising. Nandi left Howard to raise her new daughter and start a family. 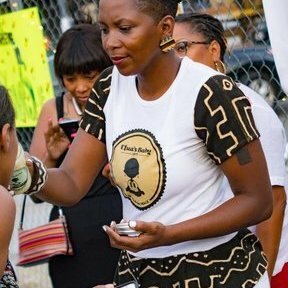 Currently, Nandi still lives in the DC area where she handcrafts soy & coconut oil candles while developing other creative works all inspired by and in honor of her mother, Efua Sauda Tonge. Efua Sauda Tonge was lost August 14, 1990, to breast cancer. Leaving behind a husband Tschaka Tonge Sr., eldest son Tschaka, son Seku, daughter Tiyika and daughter Nandi, their youngest child. Nandi has always embodied the style and grace of her Mom. She feels her mother's spirit shining thru her when she's wholesomely at her best. Around 2010, she started using the hashtag #EfuasBaby as an homage to her mom's essence and energy. A fitting tribute from the "Baby" of the family. On travel to amazing Cuba Nandi had an experience that pushed her to consistently burn candles for her mother Efua and grandmother Muriel. While burning candles for her mother and grandmother, Nandi preferred soy candles due to the toxicity and dangers found among paraffin wax candles. Soon her creative instinct flourished and she decided to teach herself how to make soy candles herself. Now, Nandi is a growing small woman business owner. Married to Haile Gabremedhin, owner of the HVAC company, STM Services. Together they have four children Sahmira, Tafari, Mekonnen, and Almaz. The entire Gabremedhin Tribe is involved in making this business possible, and that's a beautiful thing. Nandi is a Creationist so you can expect more inspired gifts to follow under the EB77 umbrella. Efua's Baby is on the rise, so stay tuned!